Maccabi Electra boosted its playoffs chances significantly by beating Bennet Cantu 75-60 at Tel Aviv’s Nokia Arena on Thursday. The result not only lifted Maccabi to a 2-2 record in Group H, but gave the Israeli champs the potential tiebreaker over Cantu, which also sports a 2-2 record. Hot shooting from Gianluca Basile gave Cantu a 39-41 edge at halftime, but the hosts locked up the Cantu attack in the third quarter as the visitors failed to score a basket, Maccabi went on a 13-1 run at one point and pulled away to a 17-point lead early in the fourth quarter. Cantu never quit, but was unable to close the gap to 8 – its winning margin from last week – the rest of the way. David Blu paced Maccabi with 14 points, Lior Eliyahu and Keith Langford added 12 apiece and Richard Hendrix, making his first start of the season, posted 9 points, 9 rebounds and 3 blocked shots. Basile paced Cantu with a season-high 20 points and Giorgi Shermadini added 15 points and 10 rebounds. Hendrix came alive with an instant impact by blocking a shot on one end and sprinting to the other for a three-point play. Outside shots from Andrea Cinciarini and Maarty Leunen kept it close, but Eliyahu pushed Maccabi ahead. 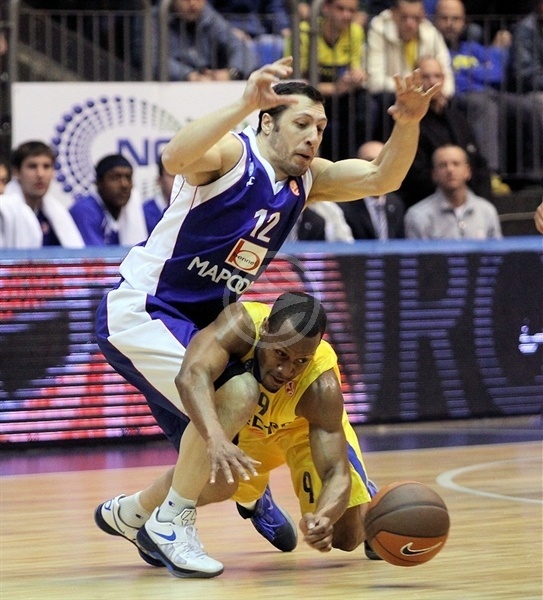 A Yogev Ohayon jumper lifted Maccabi to 9-5, but the point guard soon took a seat with 2 fouls. Cinciarini remained hot with 2 more baskets – including one on the offensive glass. Nicolas Mazzarino connected from downtown for the visitors’ first lead, 11-12. Blu hit right back from behind the arc and after Cinciarini tied the score, Demond Mallet struck from three-point land to lift the hosts to 17-14. The defenses held up on the final possessions of the first quarter as the hosts kept a 3-point edge after 10 minutes. 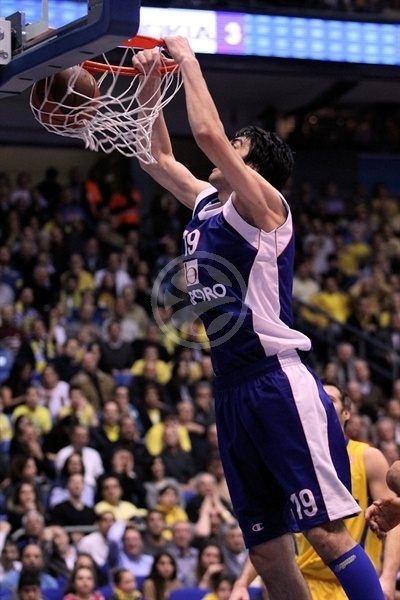 Theo Papaloukas penetrated over Denis Marconato for a basket-plus-foul to start the second quarter. Shermadini got on the scoreboard with a pair of free throws and later picked up a loose ball for a slam. He finished his personal run with a put-back-plus-foul to narrow the gap to 22-21. 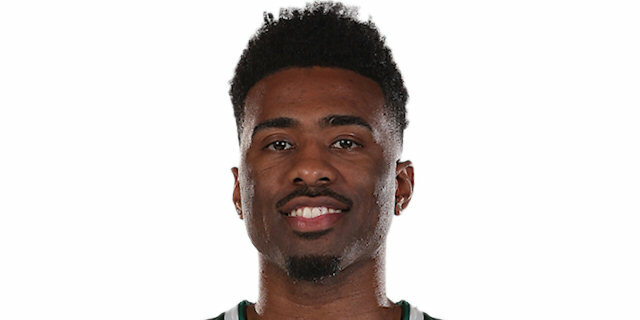 Keith Langford reversed the momentum with a drive through the Cantu defense for a slam. Ohayon added an uncontested dunk on the break as the fans got going. Basile hit right back for the visitors with a clutch three. After a timeout, Ohayon spotted an open Blu in the corner for a triple. The shots continued raining from the perimeter as Basile silenced the sold-out arena with a triple to make it 31-29. Then the veteran guard tied the game from the line before a long jumper capped a personal 0-7 run. 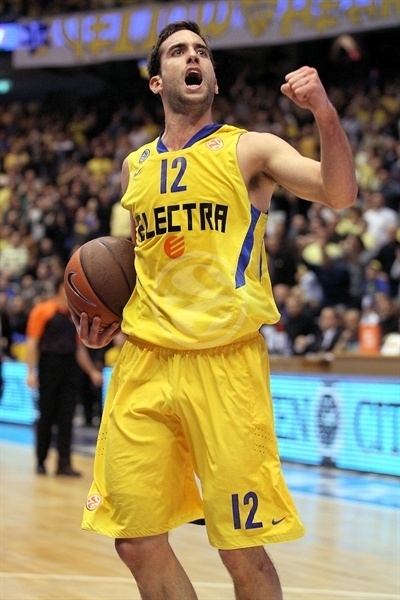 Eliyahu heated up for the hosts with free throws before Sofoklis Schortsanitis passed out of a double-team to Eliyahu for a two-handed jam. Eliyahu added another score, but Basile pulled up on the break to put Cantu up 37-38. Leunen added one more triple to put the visitors ahead 39-41 at the break. Eliyahu used his patented one-handed fling at the basket to tie the score in the first minute of the second half. 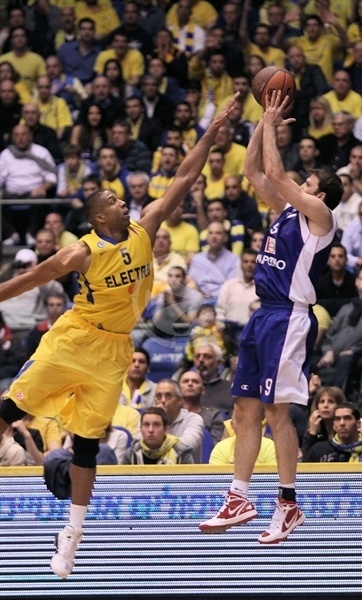 Basile finally missed and Ohayon drove for a basket-plus-foul and a Maccabi lead. After two scoreless minutes, Shermadini made it 44-43 from the line. Basket by Blu and Devin Smith pushed the hosts in front by 6. Smith added 2 from the line before Hendrix did the same to cap a 9-0 run that gave the hosts their first double-digit margin, 53-43. Blu sent Greg Brunner to the floor with a hard foul, and after he made 1 free throw, a Hendrix tip-in and Blu jumper kept the fans singing. Shermadini scored 2 from the line, but Schortsanitis inside and Smith outside lifted the lead to 62-46 as the visitors finished the third quarter without a basket. Manu Markoishvili bounced in a three-pointer two-and-a-half minutes into the fourth quarter for Cantu’s first basket of the second half. Basile added a three and was then fouled shooting another and made the resulting free throws to make it 63-55. 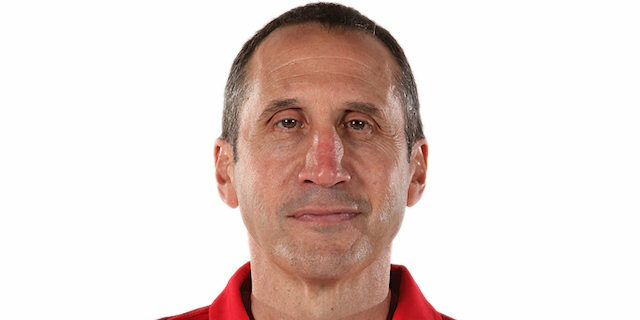 After a timeout, Langford hit a long jumper and then drove for a three-point play as the hosts regained control as the focus of the game started to revolve around Cantu’s 8-point margin of victory a week earlier. The mounting pressure could be seen in some poor shots from both ends, but Langford rose to the occasion with a three for a 71-57 lead with three minutes to play. 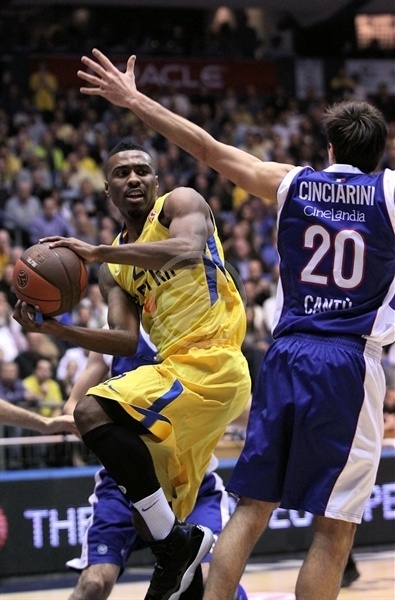 Eliyahu finished the game early with 5 fouls, but Cantu was unable to take advantage. 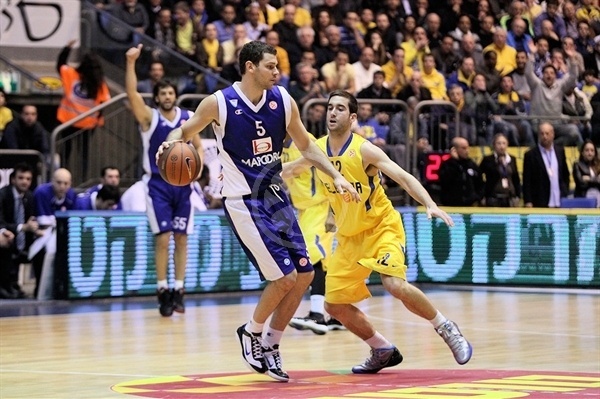 Micov penetrated to make it 73-60 with a minute remaining, however a Blu steal-and-slam capped an important Maccabi win. "We played a great first half and a solid fourth quarter, but our third period was a nightmare. This is the story of the game. 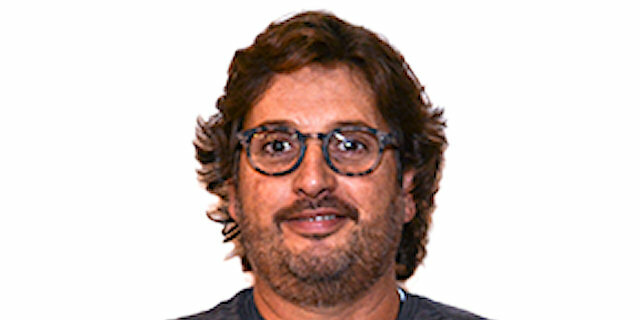 We were unable to score in the paint, and also because Maccabi sent us to the line every time that we gave the ball inside. We were pretty productive on offense in the third quarter and we have allowed opponents to run and then to expand the gap. Its clear that is not over yet. 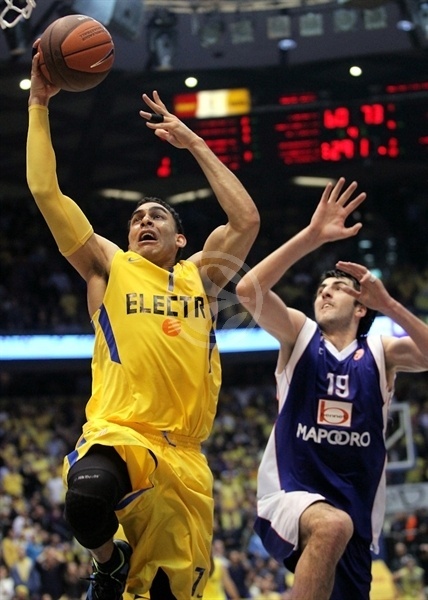 It was a great experience to play in Tel Aviv and Maccabi was a better team, they earned it. 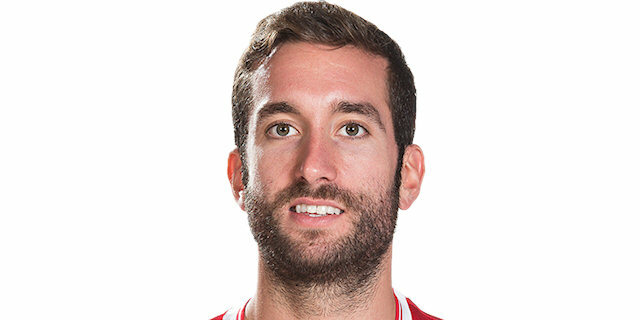 I cannot say for certain that I am happy, but we played an excellent first half. But we failed to come back home with a success and the qualification." "It was a very tough game in a very tough place. We had a very good first half and we had the lead, but in the third quarter they just stepped up their defense and it became really difficult to make a shot. We struggled and thats how they created their run. We fought hard till the end. It was very difficult to score in the third quarter and that was the difference."